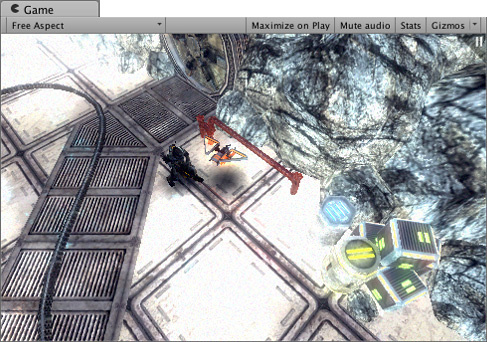 Use the buttons in the Toolbar to control the Editor Play Mode and see how your published game plays. While in Play Mode, any changes you make are temporary, and will be reset when you exit Play Mode. The Editor UI darkens to remind you of this. Scale slider Scroll right to zoom in and examine areas of the Game screen in more detail. It also allows you to zoom out to see the entire screen where the device resolution is higher than the Game view window size. You can also use the scroll wheel and middle mouse button to do this while the game is stopped or paused. Stats Oprima esto para toggle (activar/desactivar) la ventana superpuesta de Statistics (estadísticas), que contienen estadísticas de renderizado del audio y gráficas de su juego mientras usted está en el modo de juego. The Gizmos Menu contains lots of options for how objects, icons, and gizmos are displayed. This menu is available in both the Scene view and the Game view. See documentation on the Gizmos Menu for more information. Right-click the Game tab to display advanced Game View options. Warn if No Cameras Rendering: This option is enabled by default: It causes a warning to be displayed if no Cameras are rendering to the screen. This is useful for diagnosing problems such as accidentally deleting or disabling a Camera. Leave this enabled unless you are intentionally not using Cameras to render your game. Clear Every Frame in Edit Mode: This option is enabled by default: It causes the Game view to be cleared every frame when your game is not playing. This prevents smearing effects while you are configuring your game. Leave this enabled unless you are depending on the previous frame’s contents when not in Play Mode.